Objective – The learner will be able to recognize that the stars and planets are shapes in space. Procedure – Read the book Shapes in Space by Alise Robinson and Carin Reich. 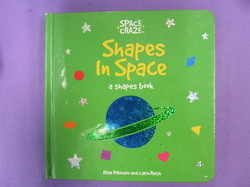 Discuss how stars and planets are shapes. Model drawing stars and planets. I show the students how to draw space rockets using rectangles and triangles. The students color the shapes with crayon and then paint with watercolor. Materials – White paper, crayons, watercolors, pencils.